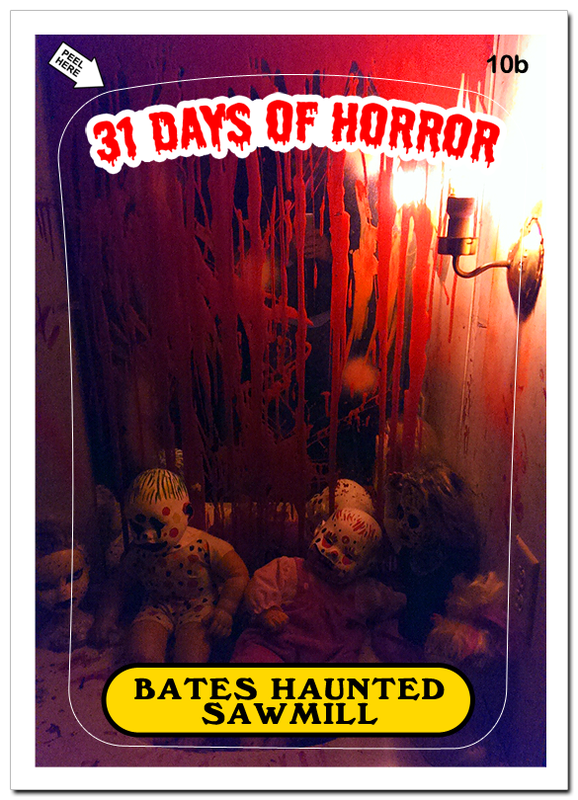 The Bates Haunted Sawmill in Millington, Michigan isn’t your average Halloween haunted attraction. While the premise is the same as every other haunted spook house (you pay for a ticket, walk through a staged horror production made up of different scenes, have a few scares and a few laughs and then you’re done) the execution at the Sawmill is in a league of its own. At the Bates Haunted Sawmill you won’t find any licensed or familiar horror movie monsters skulking about in the dark waving cheap plastic props at you. Nothing about the Sawmill is cutesy or family friendly or safe feeling. The atmosphere is one of a grimy realism that sticks with you long after you’ve left and are on your way home. It’s the type of feeling I imagine a swat team gets when it first enters a serial killer’s home. A feeling of unclean discovery and a fear of what you’ll find in the next room. The experience begins with a winding walk in a forest maze constructed of repurposed wood scraps haphazardly nailed together and makeshift walls composed of tarps and plastic sheeting. The maze is populated with fiends that pop out at you from dark corners and grab at you from gaps in the boarded up walls. The maze leads you to a ramp that takes you into a pair of trailers (mobile homes) sandwiched together. Here you’ll be greeted by room after room of soiled dolls with clown makeup, defaced Christmas decorations, static filled flickering televisions with arrows spray painted on the screens directing you where to go, refrigerators that when opened reveal hidden doorways all which is connected by dark, twisting and narrowing hallways. This “house” part of the attraction is overseen by a clan of deranged denizens that would feel at home in a Rob Zombie film or the original Texas Chainsaw Massacre. The scares at the Sawmill range from loud and sudden “jump scares”” to more subtle creeping scares that are magnified by the gritty and off putting surroundings. All the while walking through the many rooms (it will take you approximately 20-25 minutes to navigate the whole attraction) you can’t help but feel that you’re trespassing in the home of a family of psychotic serial killers and cannibals and that when they find you there, something very bad is going to happen to you. This is the second year that I have a gone to the Bates Haunted Sawmill and it is an annual tradition that my friends and I intend to carry on. The attraction is highly recommended as it is a rough and unpolished beast that wears its horror badge of honor with a gritty and demented sense of pride.